Whether it's a full on pamper or a midweek treat, a face mask is always a great way to treat your skin and feel totally fantastic at the same time. When it comes to face masks I have a few hero's, so I thought I would go ahead and share them with you today. Apologies, they're looking pretty battered and bruised, but what can I say? They're loved! 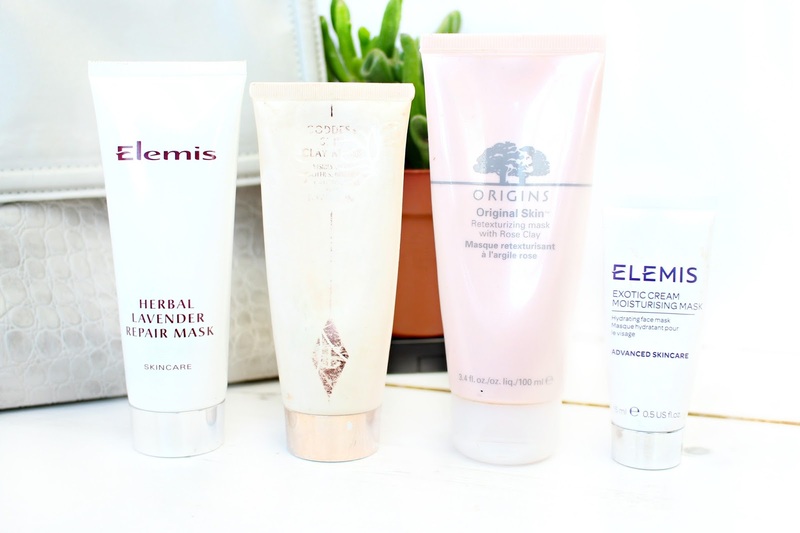 Firstly we have the Elemis Herbal Lavender Repair Mask, which is an old faithful within my collection. A soothing yet powerful clay mask, which gives sensitive, blemish prone and congested skin a much needed clean out. Next up we have what I call my "Party Mask" as it makes me feel totally fabulous after each and every use the Charlotte Tilbury Goddess Skin Clay Mask contains everything from Spanish clay to Rosehip and Sweet Almond Oil not to forget an impressive BioNymph Peptide Complex, which seriously aids collagen production. It's like cashmere for the skin. Next up we have the Origins Originak Skin Retexturizing Mask which is the ultimate glow getter out of the group! Not only is this a face mask, but it's actually an exfoliator too. Mediterranean Rose Clay, Canadian and Willow Herb gently cleanse, whilst refining the skin and restoring its clarity. Last but not least is a bit of a newbie on the block, which I received more recently in a gift set! The Elemis Exotic Cream Moisturising Mask is a beautiful creamy mask, which hydrates the skin using Mimosa, Honey, Sea Rocket, Orange and Bergamot. I love the mask for a boost of hydration and often use this midweek when my skin is a little lacking.